For many years I have had a bit of an issue with fruit being used in savory dishes. I had a very distressing experience in the hunter valley with a strawberry and scallop dish. Vomit!! 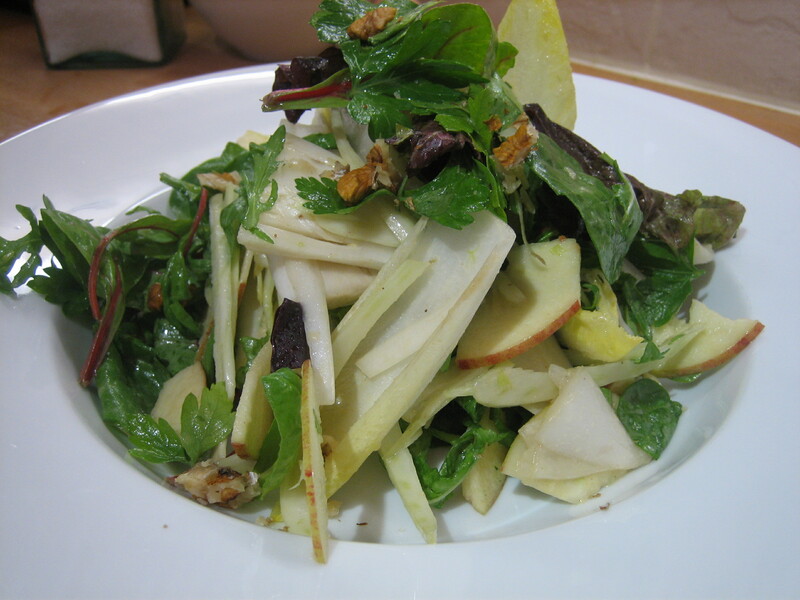 Recently I have started to branch out, throwing caution to the wind, and use the odd pear or apple in a salad. What a success!! I actually feel a wee bit silly adding this to my recipe collection as this salad really is ridiculously simple and easy to make. However there are still a great proportion of the general public headed straight towards a trusty cucumber, lettuce and tomato combo for a salad. Boring!! (unless you are using AMAZING tomatoes of course). 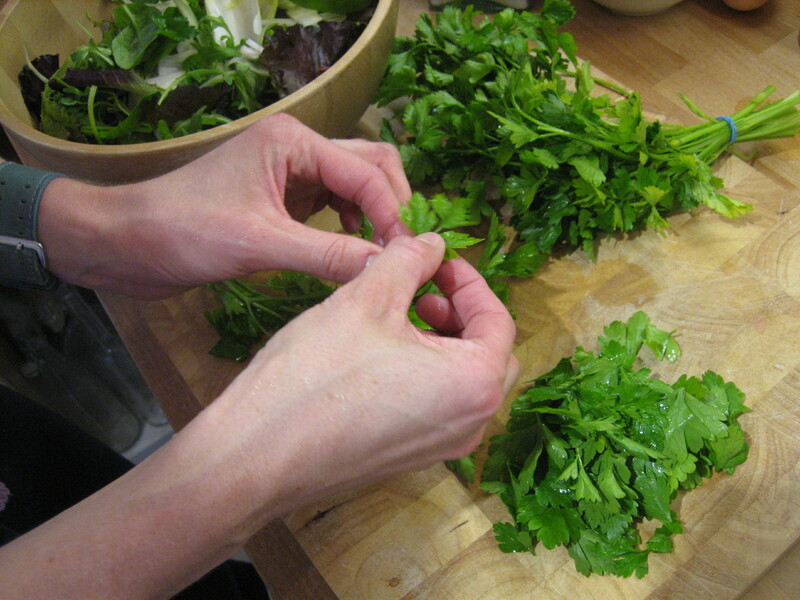 Remove outer leaves of fennel and cut of any shoots. Cut in half from top to bottom through the narrow side (leaving 2 wide halves). Very finely slice length wise. 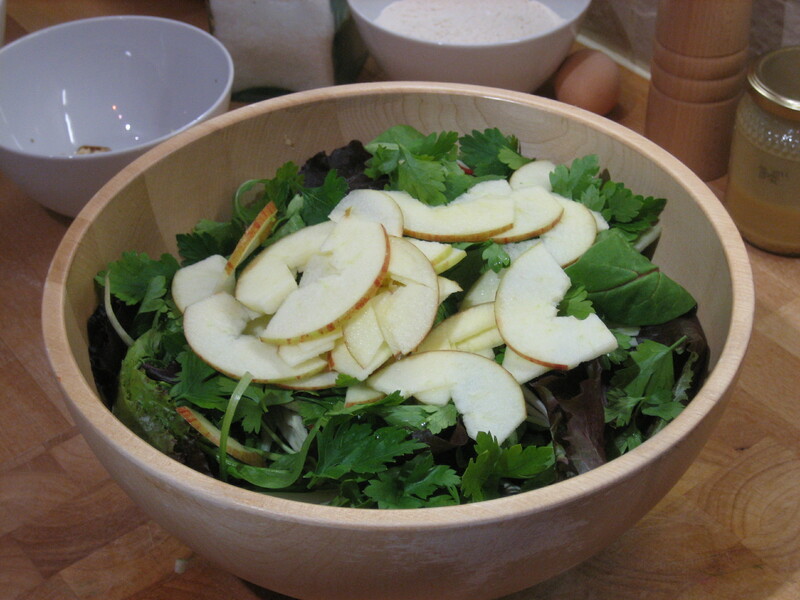 Wash and dry leaves (if not already washed) – make sure you spin the leaves in a salad spinner this is VERY important. 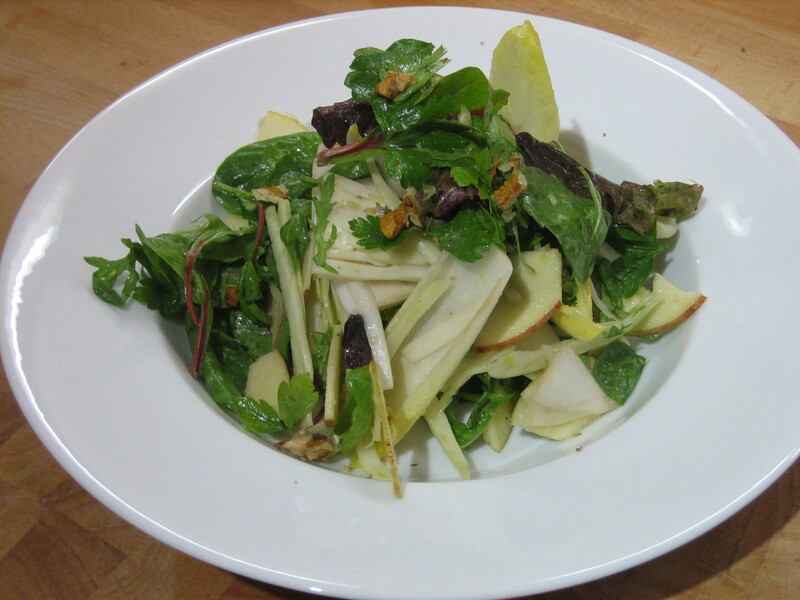 If the leaves are wet you will dilute the dressing and it will taste very average. 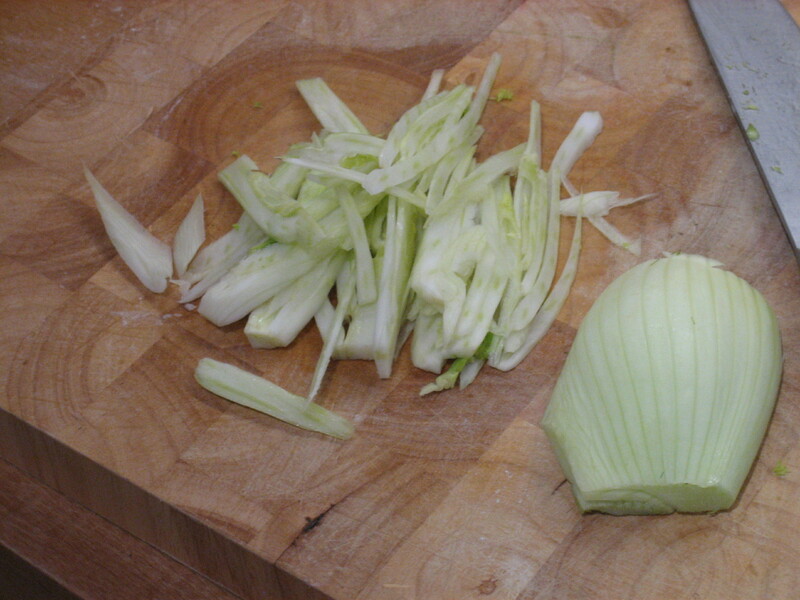 Add leaves and finely sliced fennel to a large bowl, peel the outer leaves from the chicory (witlof) and cut the bottom 1/3 off. Separate the leaves and add them to the bowl. 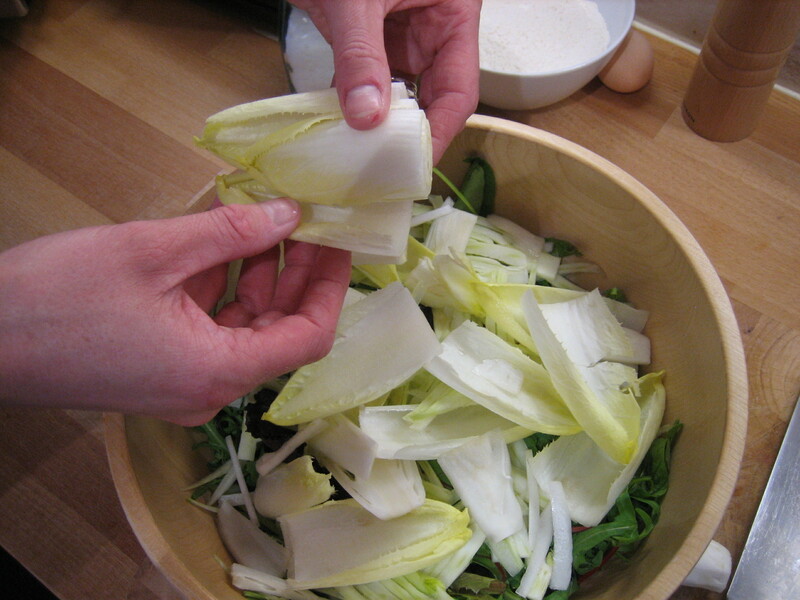 Finely slice the bottom 1/3 of the chicory and add to bowl. Wash and dry small/medium bunch of parsley. Pick off the leaves discarding any discoloured ones or stems. Add to bowl. Wash apple and cut in half removing core. Finely slice and add to bowl. To make dressing I find using a clean jam jar makes life a lot easier. Add 1 table-spoon of Dijon mustard, 1 teaspoon of runny honey about 1/2 cup of extra virgin olive oil and 1/4 cup of red wine vinegar to the jar. Put the lid on and shake, it should quickly form a thick dressing. Taste it and it should taste a little bit too vinegary – this is good. If it is a wee bit mild add a bit more vinegar. Add dressing bit by bit to salad whist lightly tossing through with your hands. The leaves should be coated but not drenched. Serve immediately! This can be eaten as a starter or along side fish, chicken, pasta, risotto etc. You can also make it more substantial and have it for lunch on its own by adding some cheese (goats cheese, brie, Gorgonzola etc) and some toasted nuts (hazelnuts, pine nuts, cashews etc). Ideally use a room temp egg, pop the egg yolk in a large bowl (you can keep and freeze the white for a cheeky meringue at a later date). Add a squeeze of lemon, a pinch of salt a couple of turns of the pepper grinder and a teaspoon of Dijon mustard. You can use an electric whisk but I prefer to use a large balloon whisk. Vigorously whisk these ingredients and while you are doing this very very slowly drip the vegetable oil into the bowl as you whisk. I really do mean drip. All of a sudden the mixture will emulsify – you will feel like it will never happen but honestly it will. After it has emulsified – it will be really quite thick. I know this sounds obvious but it will be thickish for a while and you will be thinking “is this emulsified?” but it probably won’t be. Keep going until it is like a small bit of thick mayonnaise in the bowl. Once this has happened you can add the oil in faster, once the vegetable oil is finished start adding in the olive oil. Once you are done season to taste. Now you have a basic mayonnaise. So easy!